The debut novel by Howe, The Freedom Broker appears to be no flash in the pan. It has been quickly followed up with a prescient thriller that blends action, espionage trade-craft and intrigue that provokes deep, deep thought, though it takes nerves of steel to take a seat on this jet. But it’s a short trip as it is a very fast read, and one that will remain in the mind longer than the journey. The resourceful Thea Paris (and Rif Asker) of Quantum Security return, taking two traumatised child-soldiers from an African Orphanage to London where they will be accepted into adoptive families. 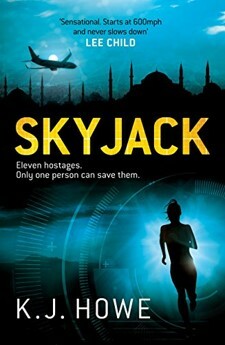 Despite her issue with heights, Thea and her team from Quantum find themselves with the boys on a charter-jet, only to have the aircraft skyjacked by the pilot (who locks the cockpit) changing course for the Libyan desert. There is little baggage in terms of back-story, as Howe provides the reader just enough detail for this thriller to read like a standalone. The plotline then diverges as we soon discover the reason for the flight change, and a name from Thea’s past - Prospero Salvatore. It seems for the release of the boys, and plane – she must take her team to Budapest for a mission that is troubling, deeply troubling. In terms of theme, I was reminded of another sophomore work, namely Frederick Forsyth’s 1972 Odessa File where secret societies that date back from our past hide in the shadows of contemporary times. It seems that there is plot to eradicate (on racial lines) a group of people; except over forty years on, CBRN technology has moved on and become even more deadly in today’s fractured geo-political world. Though filled with anxiety and action, the characters engage, such as the Austrian Johann Dietrich who is torn between his girlfriend Fatima Abboud and his own Father and the family business - Dietrich Arms Manufacturing. Thea has her own health issues, as does Johann which introduces vulnerability as well as humanity into a tough and violent narrative. So with Mafia involvement, religions, missing CBRN devices, secret societies all entangled in a Europe facing serious issues as to its future, Skyjack is a thriller that has its roots deep in the tradition of the Rogue Agent trying to restore order like the work of Geoffrey Household, Ian Fleming and Fredrick Forsyth but updated to the confront the Geopolitics of today. It also indicates that the Rogue Female of the species is far deadlier than the Rogue Male – so it is little surprise that this extraordinary novel is dedicated to the creator of Rambo, the ultimate Rogue Male. This is an excellent summer read to pack unless you are headed to Istambul; as there is enough nefarious activity to distract a reader struggling with the hassles of international airline travel. K J Howe has managed the trick of coming up with a follow-up of merit in that difficult second novel moment, just like Fredrick Forsyth did, but what Howe has for the reader is way more disturbing. Highly recommended – with short chapters that hook the reader so a bookmark is superfluous.